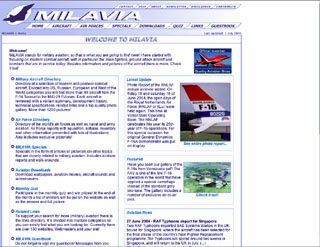 Milavia stands for Military Aviation. On this site you find information about aircraft (common but also some uncommon ones), airforces (e.g. the Fuerza Aérea Venezolana), showreports of the KLu open days, aircraft walk-arounds (e.g. RAF Jaguar), wallpapers, movies and sounds for download, a monthly quiz and a lot of links.